The freestanding nature of this brochure holder allow it to be placed in convenient locations such as on a counter top or desk. Providing easy access to important information for your customers. There are 2 size options available to suit the brochure size that you will be displaying. This item is a free standing single slot brochure holder. Available in 3 sizes. 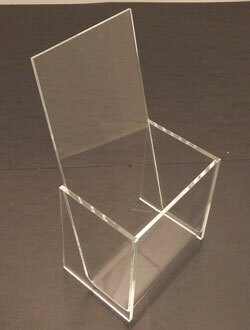 Clear acrylic construction is minimalistic and gives a professional look. Available in multiple sizes.